I’ve been working with my wife, Laura, to create some fun craft items for book lovers everywhere. 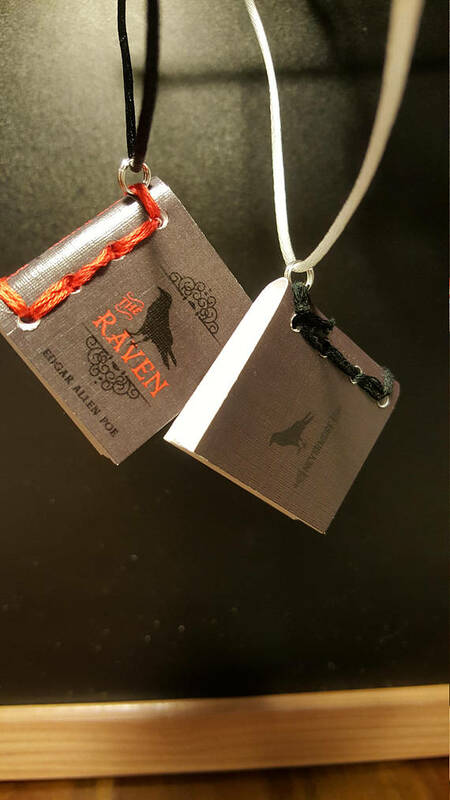 Her Etsy shop 907 in 253, is still growing, but our first project together involved creating miniature books that could either be worn as jewelry or decoratively displayed. I was just recently asked to put together a business cards design for Equal Rights Washington (ERW) Board Chair, Monisha Harrell. 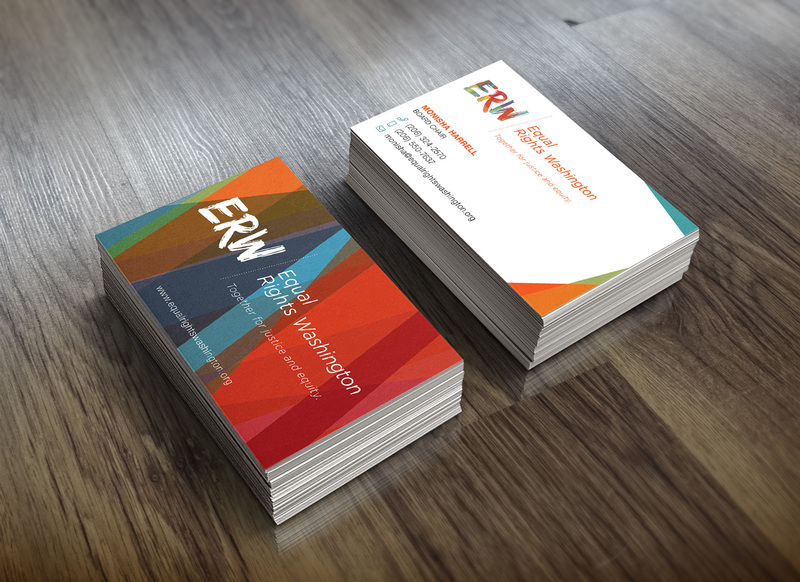 The design is clean, modern, and fits within the existing ERW branding identity. 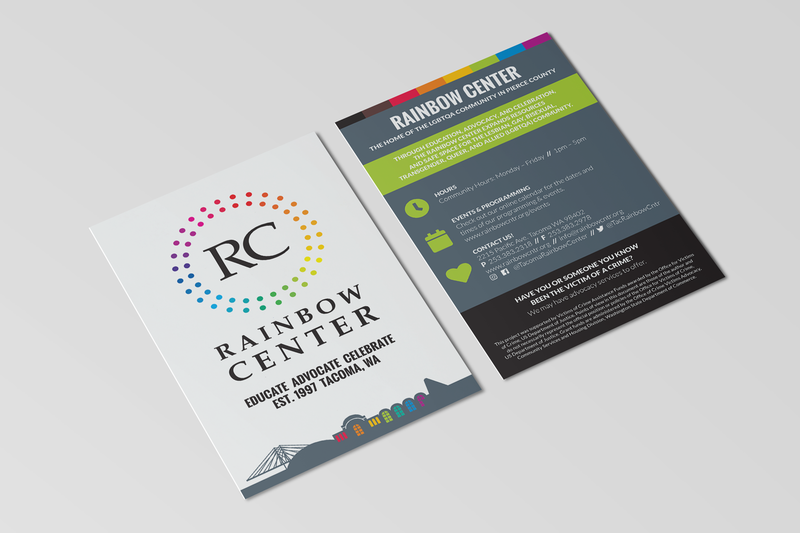 The color swatches on the front echo the colors and shape of ERW’s signature tartan pattern on the back of the card. 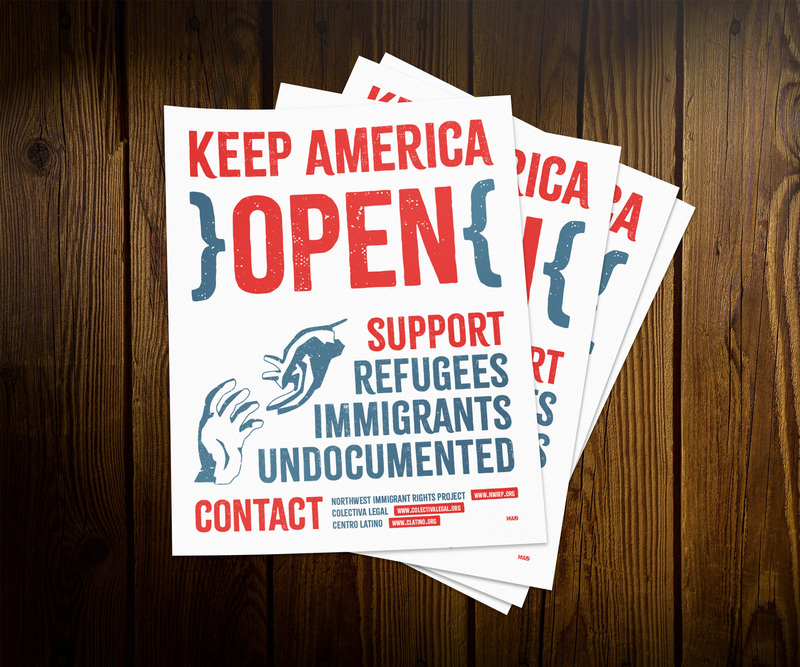 This flyers was designed as an immediate response to a wave of neo-nazi and anti-immigrant flyers distributed around Tacoma. 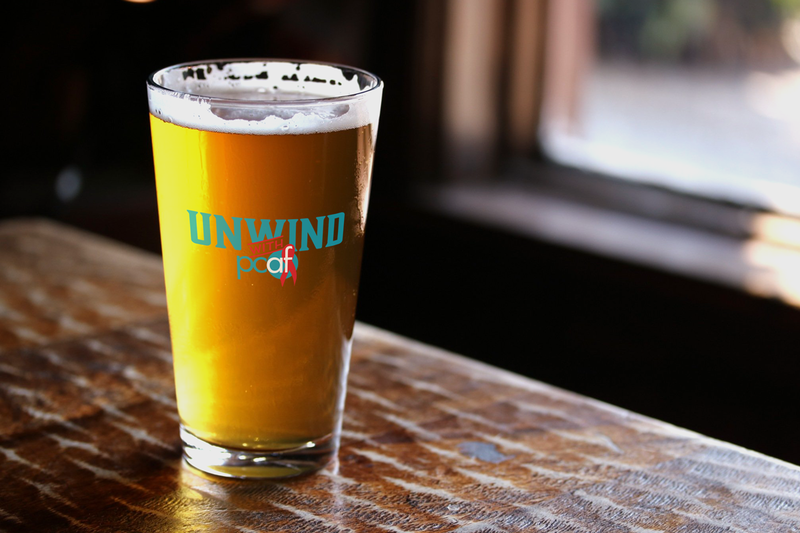 My flyer was posted online with an encouragement to others to share, post, print, and display at any location possible. 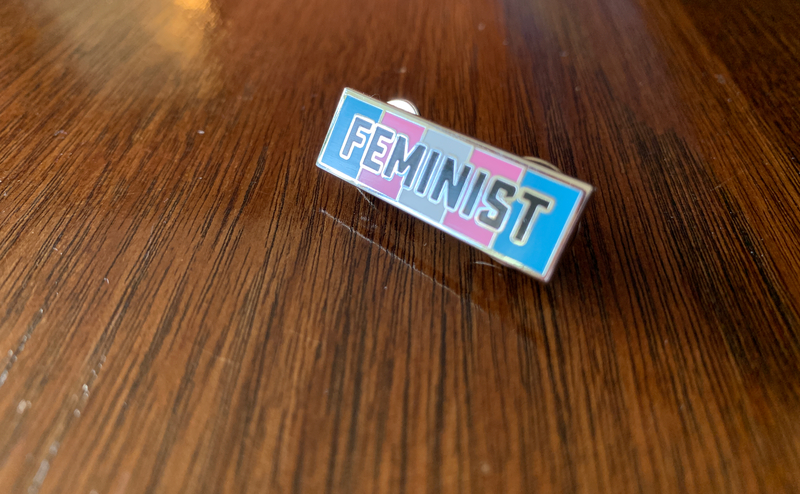 I believe that everyone, including artists, have a moral obligation to use their abilities and talents to resist bigotry, oppression, and evil. 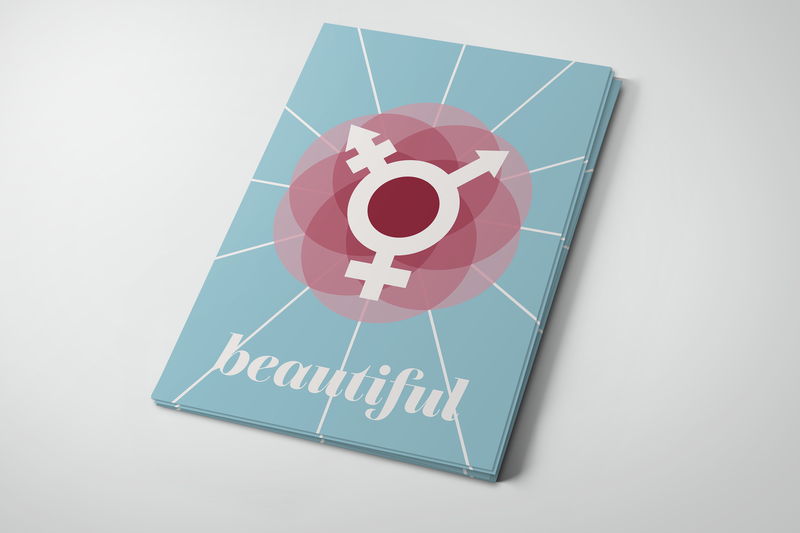 These postcards were designed as hand outs for Tacoma Tmen, a transgender discussion group, to hand out at Tacoma Pride 2018. 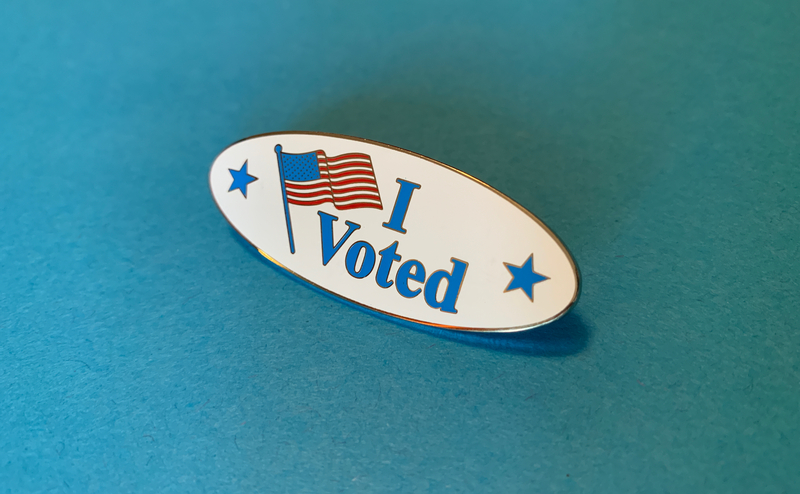 “I Voted” pins for those who love civic engagement (or live in states with mail-in voting). 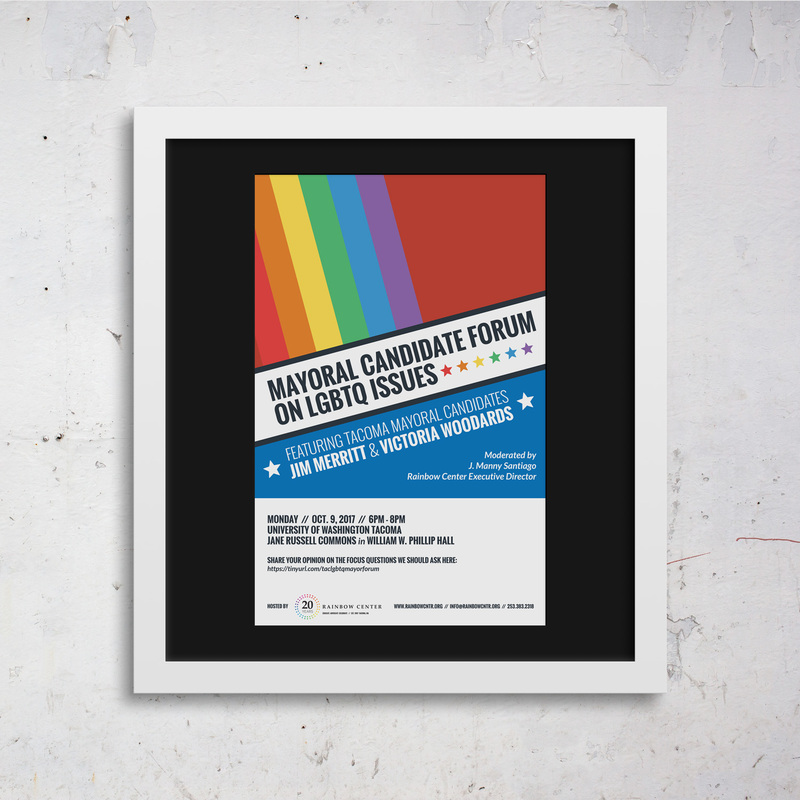 In 2017 the Rainbow Center hosted and moderated a forum on LGBTQ issues for the two Tacoma mayoral candidates. They asked me to design a poster and a few additional graphics to promote the event. 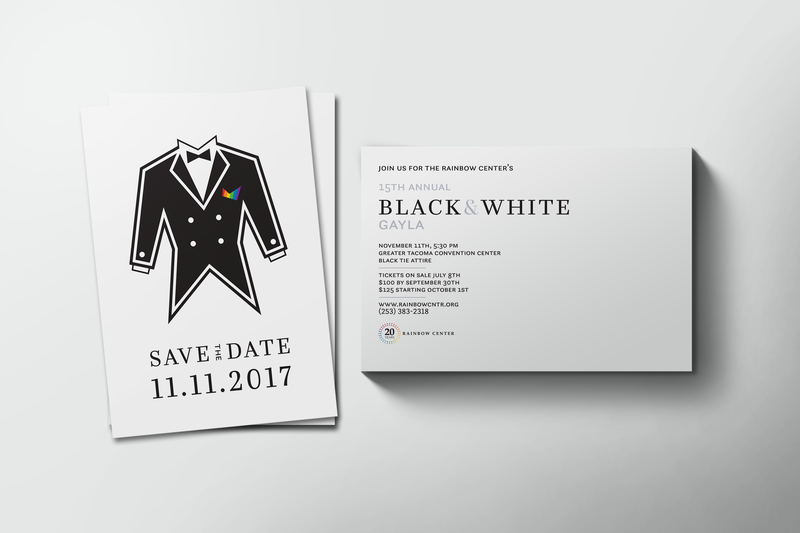 As in previous years, I had the honor of designing a number components for the Rainbow Center’s 14th Annual Black & White. The theme for 2016 was 80’s Glam. Guests were encouraged to glitz it up with big hair, bright colors, shoulder pads, and sequins. The theme was especially poignant, as 2016 saw the death of 80’s musicians and queer icons, Prince, David Bowie, and George Michael. 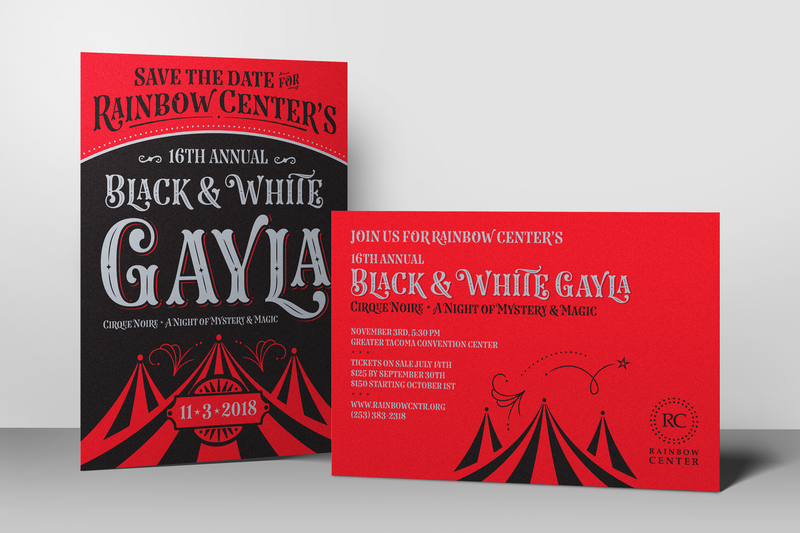 In 2015 I once again had the opportunity to create the primary designs for the Rainbow Center’s annual Black & White Gayla. 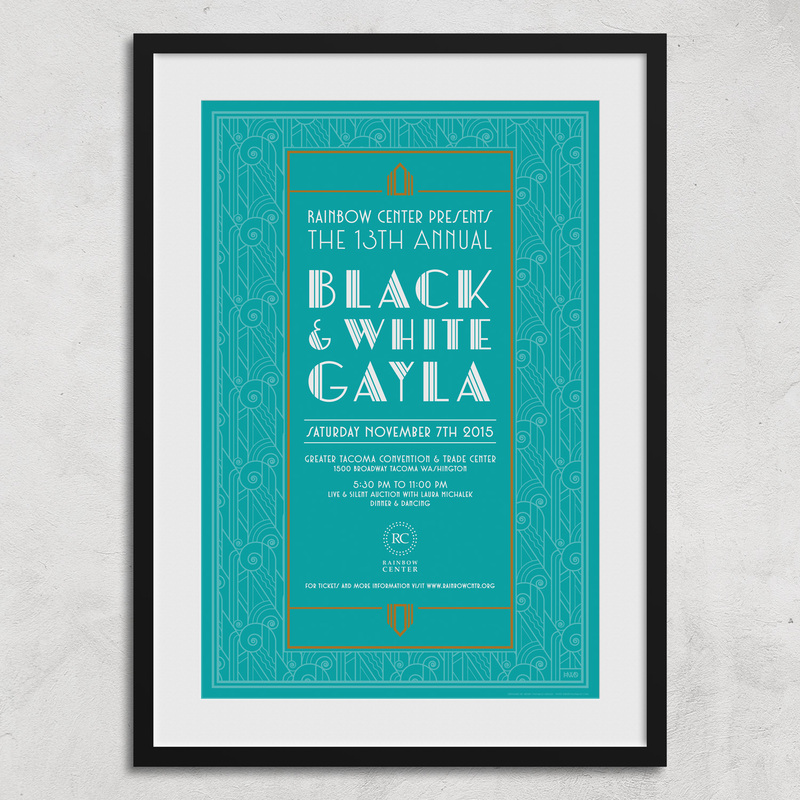 The theme for the 2015 Gayla was Roaring 20’s, with a color theme of teal and copper. The designs for this year included mostly monochromatic designs, with symmetrical, geometric elements, to invoke the the opulence of the 1920’s. 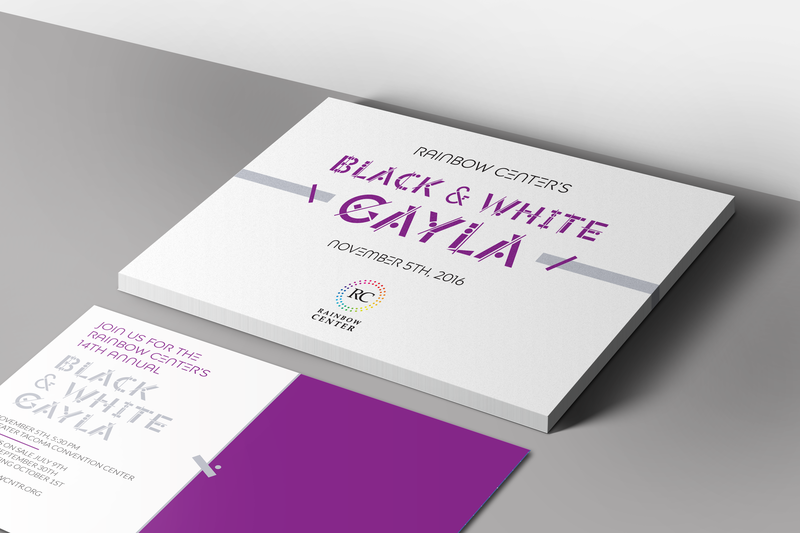 The design for the Rainbow Center’s 2014 Black & White Gayla remains one of my favorites to this day. 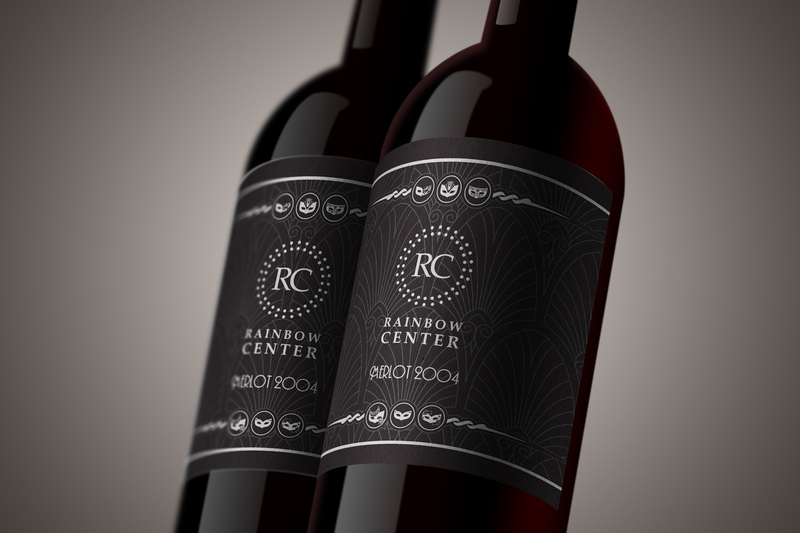 The Rainbow Center decided to celebrate with a masquerade theme, with black and silver chosen as colors. In order to keep with the formal feel of the Gayla, an emphasis was placed on having the event feel like a formal, early 20th century masquerade. 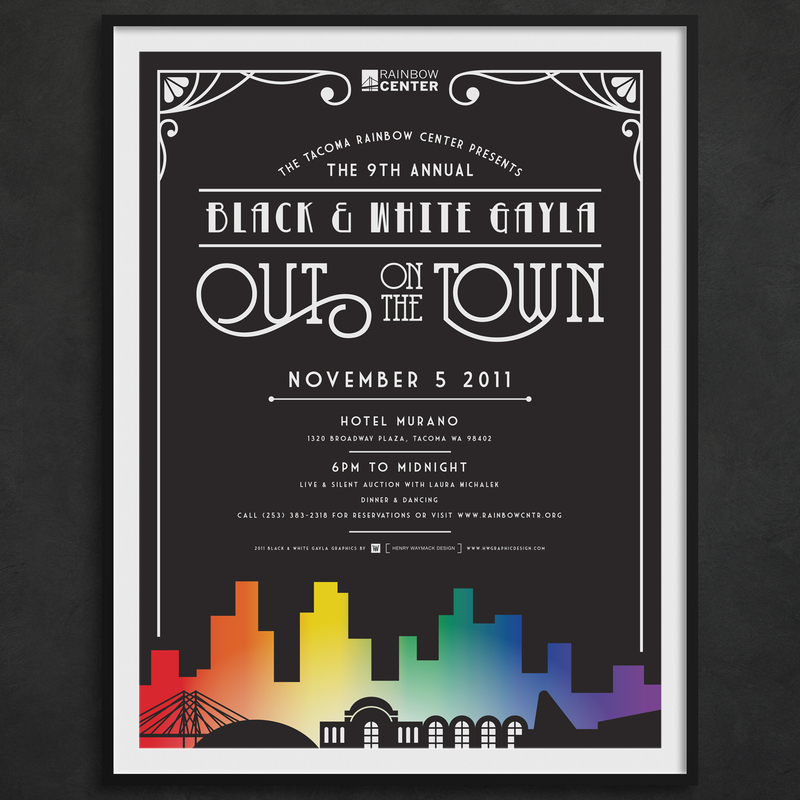 I had the opportunity to create several designs for the Rainbow Center’s 10th Annual Black & White Gayla. Their color theme for 2012 was Purple and Silver. In honor of the 10th ever Gayla, I also designed an official Gayla logo, featuring a roman numeral ten in the spotlights. 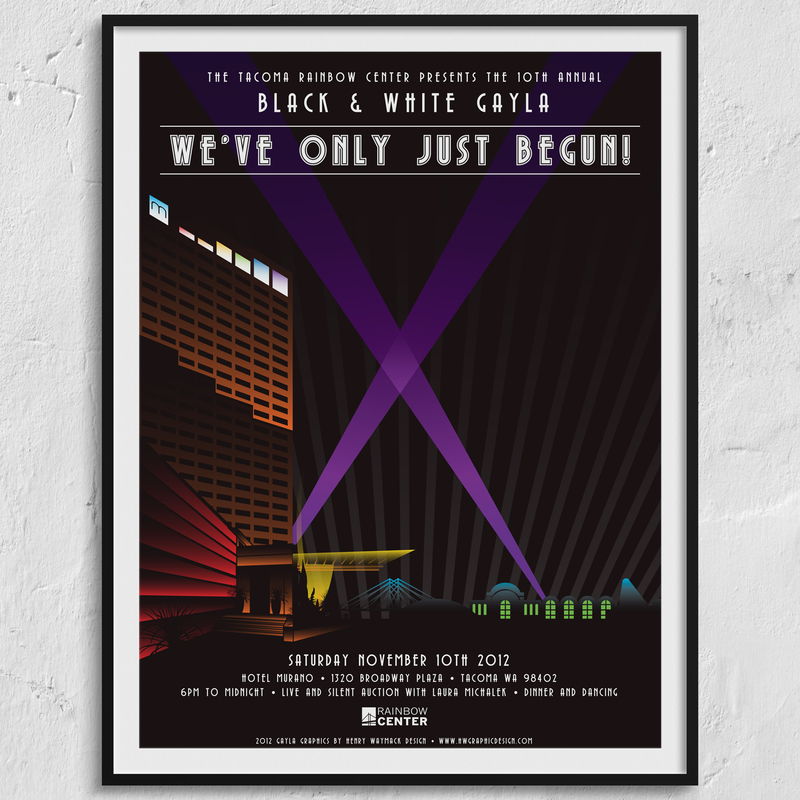 This was the first year that I had the opportunity to design promotional materials for the Black & While Gayla. 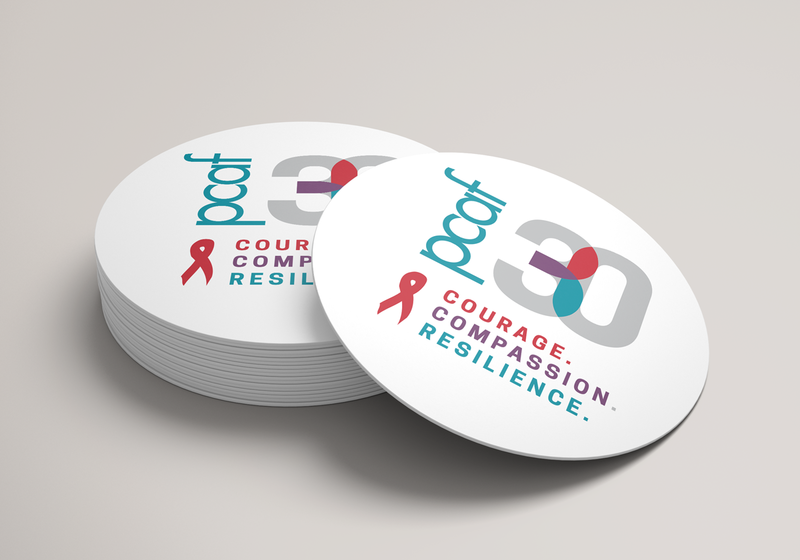 The design incorporated the bridge from the Rainbow Center’s logo at the time. 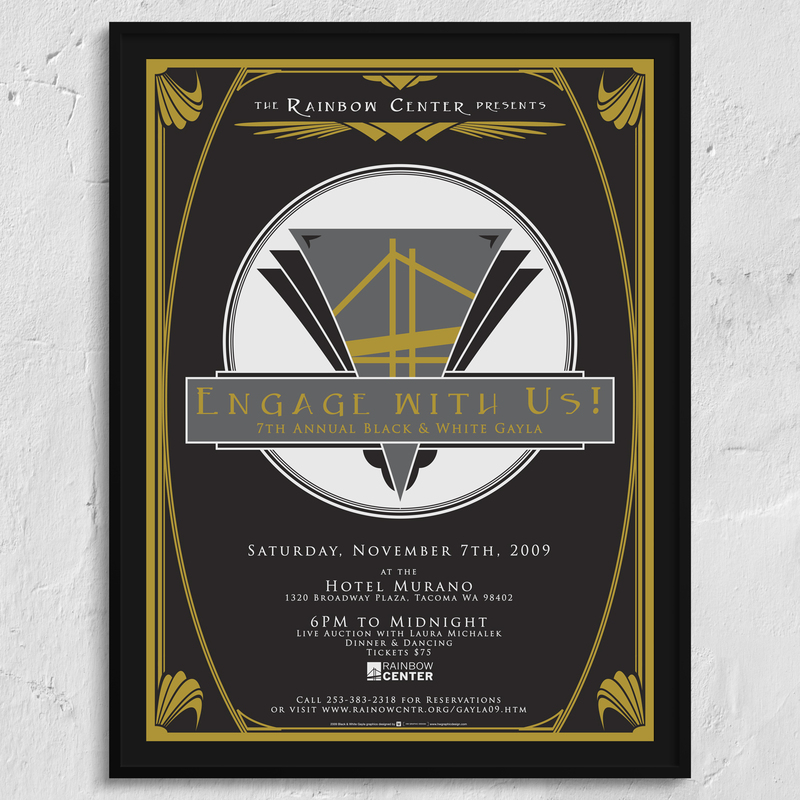 The Art Deco style has always been a favorite of mine, and it lent itself well to the formal feel of the occasion, and would find its way into the designs of future Gayla pieces.